Category 1: Waste that comes from non-European international flights. Category 3: Residues of organic matter and other waste that come from national and European flights. Packaging: Packaging waste generated in catering facilities and on flights with onboard waste separation. Paper and Cardboard: Paper and cardboard waste generated in catering facilities. In 2016 and 2017 the total waste production remained, while in 2018 it increased by 5%. One of the objectives of the LIFE Zero Cabin Waste Project is a 5% reduction in waste, and it is expected that the different measures that will be applied during 2019 will help us to achieve this goal. Regarding the evolution of the different types of waste, Category 1 has been reduced and Category 3 has slightly increased. The recyclable fraction, packaging and cardboard, have increased in both cases. 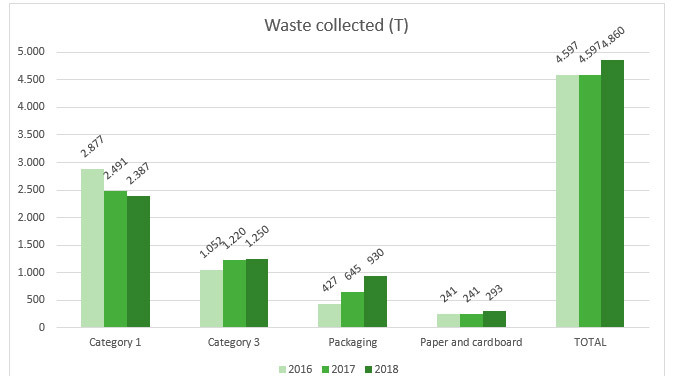 In the case of packaging waste, this fraction doubles between 2016 and 2018, going from 427 T to 930 T. This jump may be due to internal changes in the catering to improve the separation of waste and the start of separation on board at the end of 2018.